Yem Chroeum claims he did not knowingly infect his patients. AN UNLICENCED CAMBODIAN doctor who allegedly infected more than 200 people with HIV, including some who later died, has gone on trial for murder. The case has shone a spotlight on the chronically underfunded health care system in an impoverished nation where many have to rely on self-taught or unlicensed medics to receive treatment. 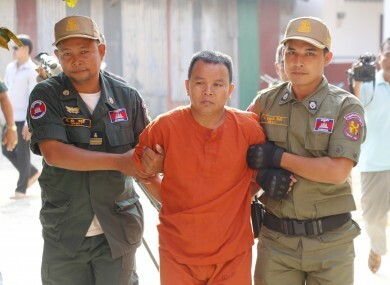 Yem Chroeum, 55, is accused of infecting locals in the remote village of Roka in western Battambang province by reusing dirty needles. Em Sovann, his lawyer, said the court has set a five-day trial. “In the courtroom my client still claims he is innocent,” Em Sovann said, adding that the doctor did not deliberately or knowingly infect his patients. Yem Chroeum faces charges of murder, deliberately infecting patients with HIV and running an unlicensed clinic. He faces life in prison if convicted, Em Sovann said. For millions of Cambodians — especially the poor and those in remote regions — unlicensed doctors are the only realistic healthcare option for everyday ailments. World Bank figures say Cambodia, one of Asia’s poorest nations, has just 0.2 doctors for every 100,000 people, on a par with Afghanistan. Similarly impoverished Myanmar has 0.4 per 100,000, while France boasts 3.2 per 100,000. Much of Cambodia’s shortfall is made up by unlicensed practitioners. But the HIV infections in Roka shocked the country and saw the government vow to crack down on unlicensed health providers. Some of those who were infected are expected to testify at the trial. Loeum Lorn, 52, said he and four of his family members had become HIV-positive. “We are his (the doctor’s) victims but it was only late on that we discovered we were infected,” he told reporters outside the court. He added that around ten villagers who were infected, mostly elderly, had since died. At the trial Tuesday prosecutor Heng Luy accused the doctor of hiding the facts and changing his story. Email “A doctor is on trial for murder after infecting hundreds of patients with HIV”. Feedback on “A doctor is on trial for murder after infecting hundreds of patients with HIV”.